Being both a mum and school teacher, I understand how rushed school mornings can be. I also know what a daunting task it can be trying to create a nutritious breakfast for the whole family so that everyone can start the day at their best. With a little prep time (either on the weekend or night before) and the right ingredients on hand, you can create a grab and go breakfast that satisfies the whole family, is healthy and nutritious and still get out the door with plenty of time to spare. Chia puddings are the easiest meal to prepare. Rich in omega fats for a boost to skin and brain health, they’re also loaded with fibre and antioxidants. Mix 3 tablespoons of chia seeds to 1 cup of your preferred non-dairy milk then add in your favourite nuts, seeds, fruit and spices (cinnamon, cloves and vanilla are great choices). Leave overnight and you’ll have a tasty pudding ready when you wake up. Prepare in a jar if you need to eat on the run. 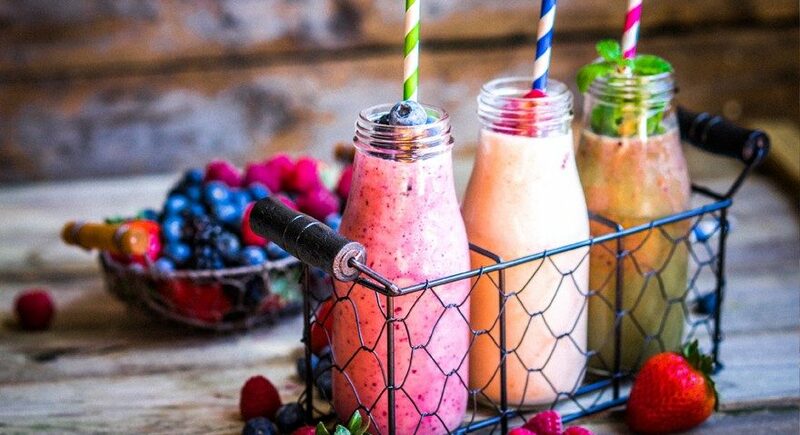 Fruit and vegetable smoothies are an excellent breakfast option as they are rich in minerals, hydrating and super quick to make. They’re also a great way to sneak in a few extra greens for fussy kids. Start with your preferred liquid base (almond, coconut milk or coconut water always work well), add in whatever fruit and veg you have on hand, a scoop of protein powder along with some quality fats such as avocado and coconut oil and blend together for a nutrient rich start to the day. Make the night before and store in sealed jars ready for the next morning. Looking for inspiration? Try our delicious macadamia blueberry smoothie sensation sure to delight kids and adults alike. I’ll happily put my hand up to say I’m a massive fan of the humble muffin. With endless flavour options from beetroot and dark chocolate to savoury zucchini, feta and olive, the possibilities are endless. You can make them on the weekend and freeze for throughout the week. Check out these tasty pumpkin hemp muffins for gold star goodness. Loaded with breakfast vitals such as protein, fibre, good fats and minimal sugar, bircher museli is a massive tick in our household. For two large servings place 1 cup of oats, ½ cup almonds, ¼ cup sunflower or pumpkin seeds, 1 Tbs shredded coconut, ¼ cup sultanas, raisins or goji berries, ½ tsp cinnamon and a pinch of salt in a large bowl. Pour in 1 cup of your favourite non-dairy or organic milk and leave overnight in the fridge. In the morning simply stir through a grated apple, fresh berries, a little raw honey and top with yoghurt for an instant healthful breakfast. Protein bars aren’t just a post workout snack. They taste sensational, they store well in the fridge or freezer and with high levels of healthy fats and protein will keep you satisfied until lunch. Make them yourself from a range of nuts, seeds and dried fruit with either rice, pea, hemp or whey protein powders. Those little brains will be firing all day…especially if you make these sesame and coconut protein bars containing brain powering MCT oil. What’s your favourite grab and go breakfast idea? We’d love to hear your thoughts?